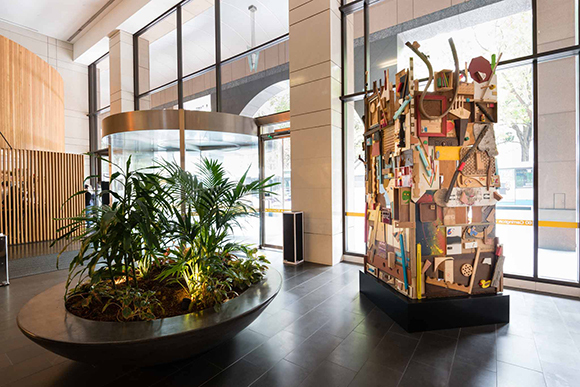 To celebrate National Recycling Week, Arts Brookfield once again brought art to public spaces, this time with stunning site-specific sculptural installations made from recycled materials, displayed in select Sydney CBD office buildings. 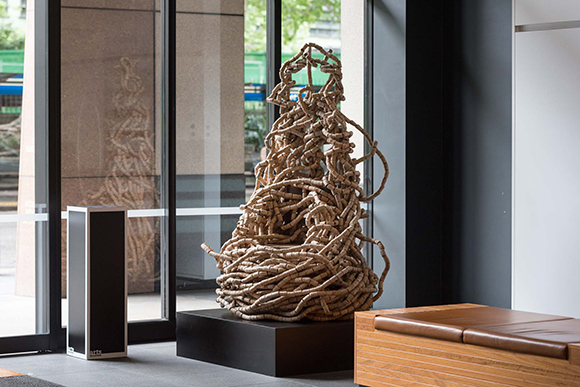 Contemporary Australian sculptor, Jane Gillings, was commissioned to produce three sculptures using reclaimed and recycled resources. 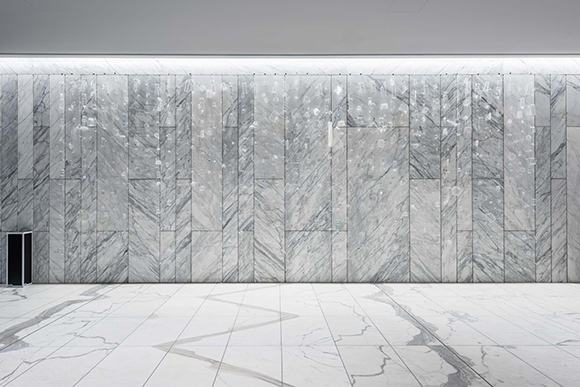 Her artworks were displayed in the foyers of 10 Shelley Street, 50 Carrington Street and 60 Carrington Street in Sydney’s CBD for the month of November. 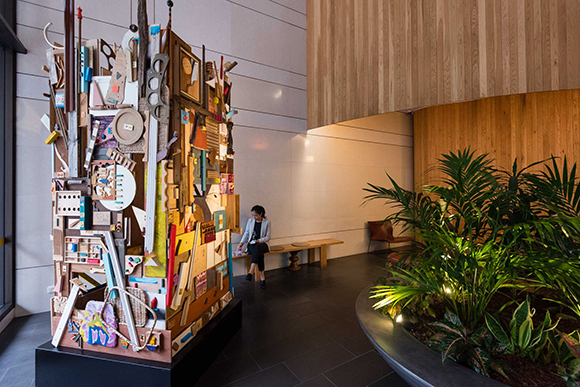 This sculpture – a pixelated version of a tree stump – was constructed from bits of old furniture, cast off wooden toys, and discards from homes and the building industry. 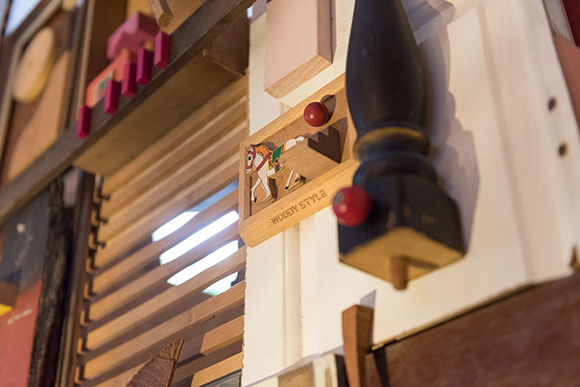 It calls to our attention the enormous amount of valuable timber that goes to waste in our throwaway culture. 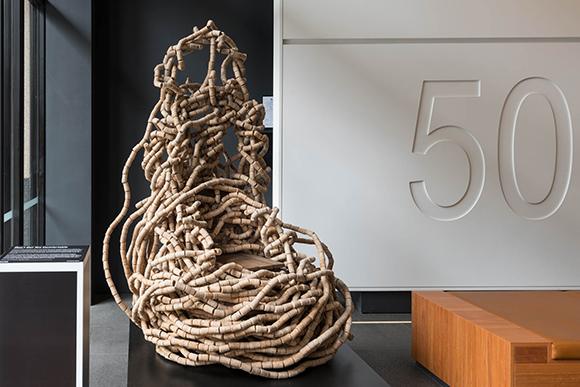 Created from sparkling wine corks threaded onto fencing wire, the long tendrils of this instillation wrap around a small wooden chair. Long associated with opulence and celebration, cork is in fact a finite resource, with demand currently outstripping supply, leading to the use of ecologically damaging plastic corks. 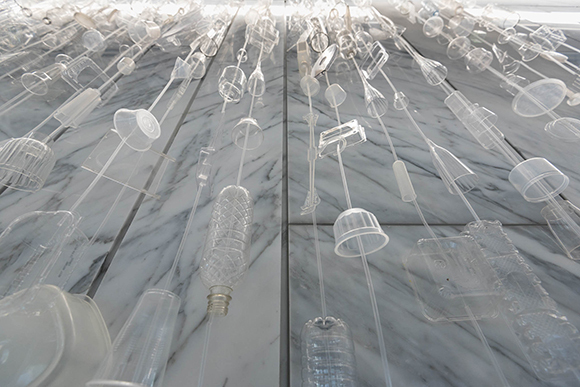 Discarded clear plastic objects – including disposable straws, cups and packaging – were threaded onto fishing wire and made to ‘rain down’ from the ceiling in this visually arresting installation. 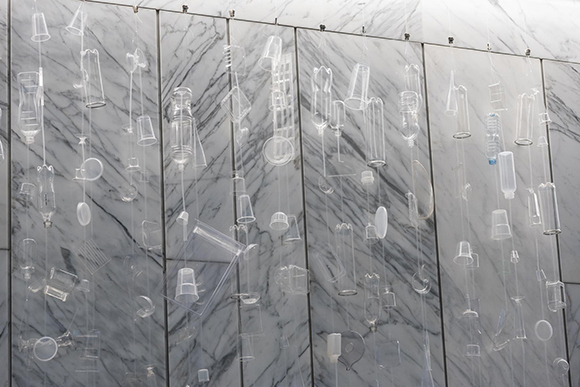 It represents the increasingly intense natural disasters such as hurricanes and storms that climate change has brought about and highlights the often-invisible damage that these transparent materials do to our ocean habitat. 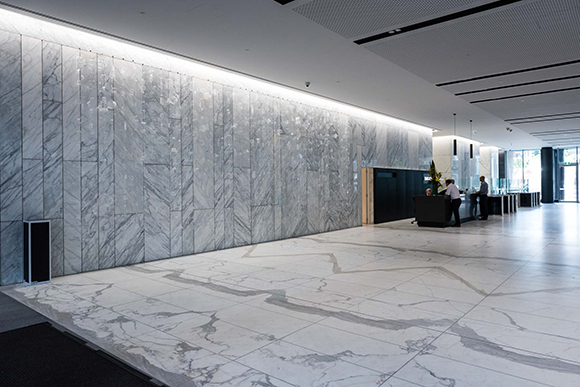 National Recycling Week aims to increase the number of businesses and workplaces involved in recycling, as well as promote community re-use and recycling initiatives. 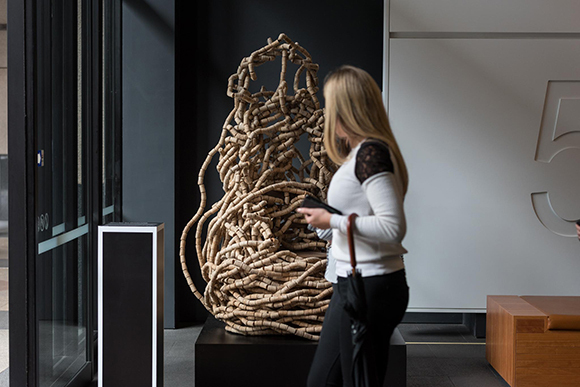 This sculptural installation project was presented by Arts Brookfield, and curated and produced by aMBUSH Gallery (an initiative of Wiltshire + Dimas).